In an age of electronic communication it is easy to forget the vital role that letter-writing played in people’s everyday lives in the nineteenth century. In an age of electronic communication it is easy to forget the vital role that letter-writing played in people’s everyday lives in the nineteenth century. Critical attention has tended to focus more on the communicative function of letters than on what is often considered as the more mundane material aspects of letter exchange such as the postal service or the type of stationery used. This article explores the impact of mid-century postal reforms, improved transportation and new postal products on the letter-writing practice and epistolary relationships of Arthur Hugh Clough. My reasons for making Clough the central case study of this piece are two-fold: firstly, because of the large body of correspondence that exists between him and his American literary friends over the period of the mid-nineteenth century (c.1847-1861); and secondly, Clough’s interest in, and innovative use of the epistolary form in his poetry. The article underlines the significance of the postal revolution for Clough’s life and work, which can hardly be overstated. The greatly improved transatlantic mail service enabled him to keep in regular contact with his closest friends and publishers and to send them, over a period of several years, all the revisions and additions to his most important work: Amours de Voyage, published for the first time in the US in 1858; his acclaimed translation of Plutarch’s Lives (1859) and the definitive edition of his collected poems, published posthumously in the USA in 1862. The article also highlights instances where material circumstances—the curtailment of the transatlantic mail service, or lost and delayed letters—had an adverse effect on Clough’s correspondence and on his publishing projects. On this point, I draw parallels with Clough’s epistolary poetry—most notably Amours de Voyage—whose form and plot clearly illustrate the importance he attached to the medium of correspondence. The article also demonstrates Clough’s awareness of the role played by postal products in the construction of an “epistolary self”—another aspect of materiality that is reflected in his creative work. Clough is the central figure of this study but I have widened the focus in some places to include some apposite quotations from the Brownings’ correspondence and Carlyle’s letters to demonstrate the far-reaching effects of the material aspects of letter-writing on the correspondence culture of the time. 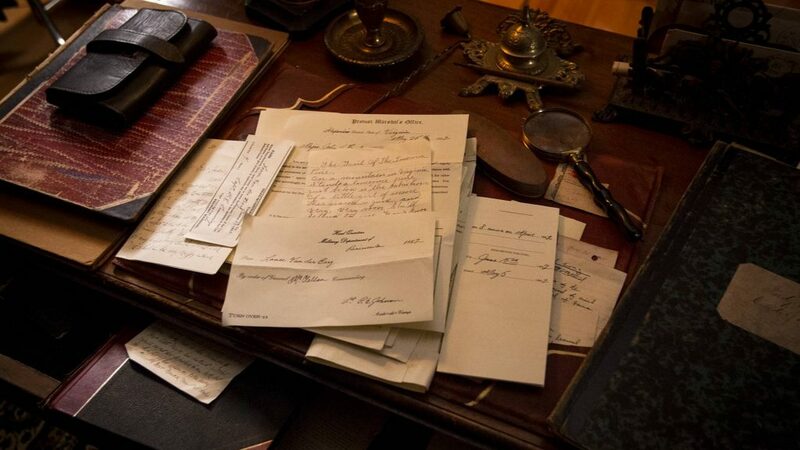 The mid-nineteenth century was a great age of letter-writing; during the period there was an unprecedented rise in the number of letters sent, not only within Britain’s national borders, but to all corners of her burgeoning empire. This was largely due to the introduction of the Penny Post 1840, which, with the rapid expansion of the rail network and the introduction of steamships on the transatlantic routes, created the optimum conditions for writing letters. Prior to 1840, the cost of inland postage was prohibitively expensive; it was calculated according to the number of sheets multiplied by the distance traveled. Additional charges were often levied and the burden of payment fell on the recipient, which did nothing to encourage frequent communication. The Penny Post Act drastically reduced the cost of an inland letter to a universal flat rate of just one penny for a half an ounce, and the introduction of the prepaid penny stamp removed the deterrent to accepting a letter (“Uniform Penny Postage”). On the eve of this far-reaching reform Carlyle, a prolific letter-writer, looked forward with glee to the prospect of being able to “write one another a mere How-d’ye-do, without apprehension of its being too dear. Whenever one likes, or has half a word to say, one may write!” (CLO 12:3-5). And he was clearly not alone, as the removal of cost constraints resulted in a huge increase in the number of letters sent—from 75.9 million in 1839 to a remarkable 410.8 million in 1853 (Barton and Hall 88). Your letter came just after the hope of one had past—the latest saturday post had gone, they said: & I was beginning to be as vexed as possible, looking into the long letterless sunday. Then, suddenly came the knock—the postman redivivus … just when it seemed so beyond hoping for––it was half past eight, observe … & there had been a post at nearly eight—suddenly came the knock, & your letter with it. Was I not glad, do you think? (BC Letter 2179). 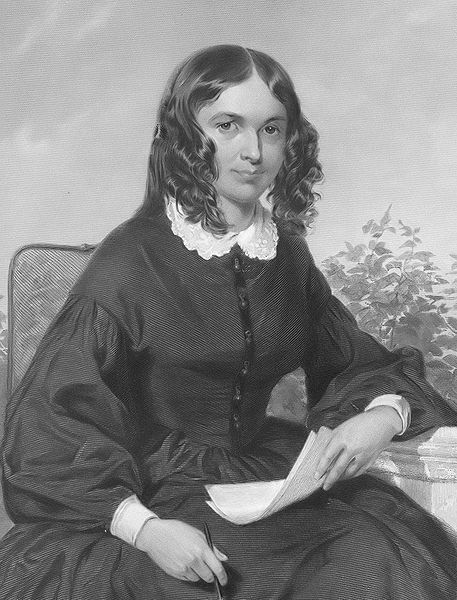 For Elizabeth Barrett, even the intervention of Christmas was no valid reason for a curtailment in the service, as she wrote somewhat resentfully to Browning: “The post-office people were so resolved on keeping their Christmas, that they would not let me keep mine—No post all day, after that general post before noon, which never brings me anything worth the breaking of a seal.” (BC Letter 2149). Letters for Browning and Barrett often served as a proxy for the physical presence of the other, through the kind of complex interaction between the material medium of communication and the letter-writer’s self-representation that Esther Milne describes in Milne, Chapters 1 & 2. “And so, with this letter, please to understand that I go to you twice & wholly, once in the spirit, & again in the body” (EBB, BC Letter 2384). Despite her ill-health, Barrett liked, wherever possible, to take her letters in person to one of the several London “receiving houses” that had sprung up to handle the huge upsurge in the volume of mail, noting on one occasion that “with my own hand I dropped [your letter] into the post. I liked to do it beyond what you discern” (BC Letter 2386). Arthur Hugh Clough, another inveterate letter-writer, also liked to hand-deliver his letters so as not to miss the post. The following extracts from Clough’s letters show that he was as preoccupied by mail collection and delivery timetables as the Brownings: “it is Friday 5¼ pm & I must get this into the Post & do sundry other things before 6pm”… ; “Farewell—I must be off … or else I shall miss the post” (unpublished portion of letter 19 May 1854; Mulhauser 469). The nearest branch post office to the Council Office in Downing Street, where Clough worked from 1853 until his death, was Charing Cross. From there, the mail would be transported by red mail-cart in “milk-white, cream-coloured and gingerbread-coloured bags” to the main post office at St Martin’s-le-Grand to await the frenetic sorting process, which began soon after 8pm. 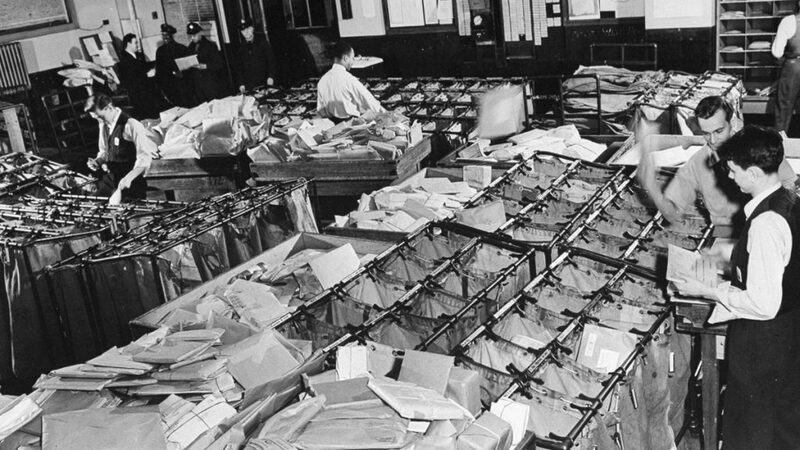 Great heaps of letters were date-stamped at a rate of 200 per minute and rapidly examined to check that sufficient postage had been paid, before having their stamps “obliterated by the right hands of 20 stampers” who could “destroy 6000-7000 Queen’s heads in an hour” (“Valentine’s Day at the Post Office”). George Elgar Hicks’s painting The General Post Office, One Minute to Six (1860), which is discussed in Golden (107-8), depicts a diverse crowd gathering outside St Martin’s-le-Grand just before the six o’clock closing time, demonstrating how vital the postal service had become to the lives of people in mid-Victorian Britain. Euston station travers[ing] the streets not far off” (Mulhauser 476). poor Jane had put in the American Letters indeed, but never dreamed of paying the shilling apiece for them! There they were therefore, lying hard and fast in the Dead Letter Office, the Post-Office sealed till Monday morning, and the Mail Steamer sure to sail from Liverpool without them! I hardly remember a more provoking circumstance; poor Jane was in despair: we knew not what to do. (CLO 16: 207-208). 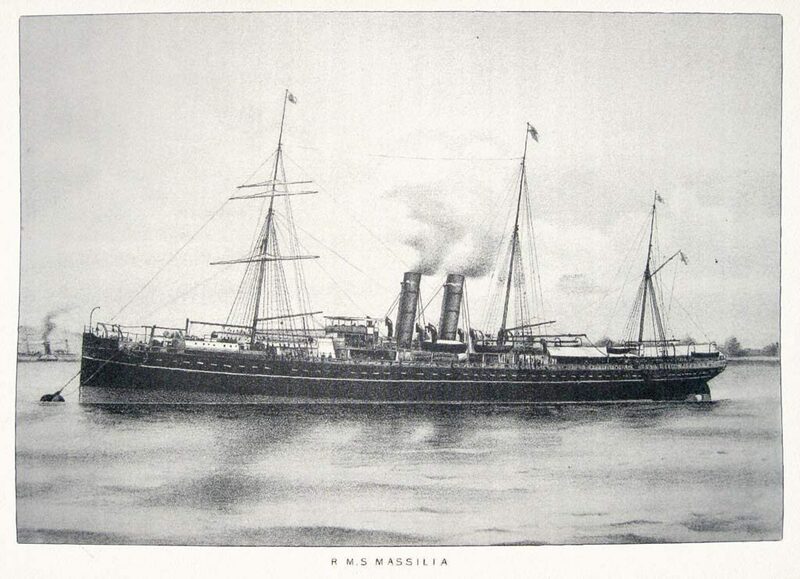 Carlyle was forced to take drastic measures to avoid missing the Boston steamer—he eventually managed to persuade an influential Civil Service friend to allow him to send a fresh letter via the official “Government Bag”; a clear illustration of the potential for material circumstances to interrupt the free flow of transatlantic communication to and from nineteenth-century Britain. Scutari (Mulhauser 489-90). Norton’s concern about the time lag in their communication is evident from the delight he expressed at finally receiving a letter from Clough, and in his reply he joked that he had begun to think their correspondence was “like small clothes before suspenders were invented, not to be kept up” (Norton I, 130). 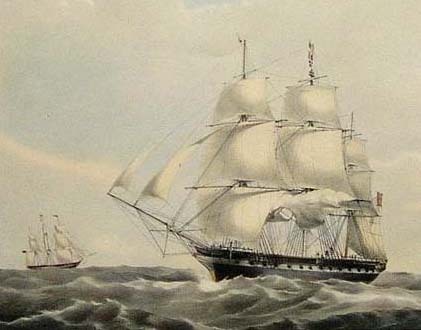 It is a testament to the strength of their friendship, however, that Clough’s correspondence with Norton resumed its old regular monthly pattern during the latter part of 1856, when Cunard’s weekly sailings to Boston and New York resumed. 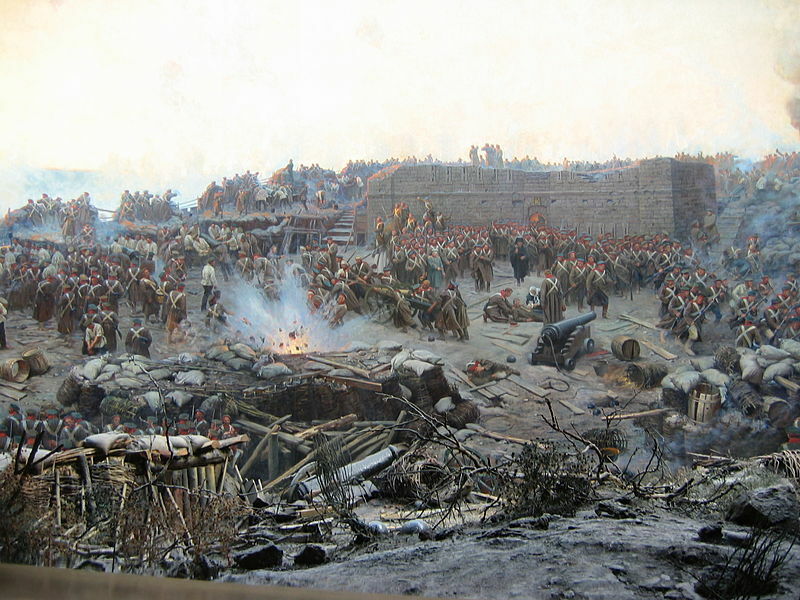 The reduction in the transatlantic postal service during the Crimean War had more serious consequences for Clough’s creative work. It could well explain, for example, why the fairly advanced plans for Amours de Voyageand other poems, made by Clough and Norton in 1854, failed to result in publication. Even more catastrophic was the loss some years later of a marked-up copy of The Bothie which Clough sent with a letter to Norton for inclusion in the planned collected edition of his poems, which was never retrieved. Clough’s awareness of the material factors that could have a bearing on letter-writing carried over into his creative work, most clearly in his epistolary “verse novel”, Amours de Voyage. The poem itself consists almost entirely of a series of letters from the fictional hero Claude to his insubstantial correspondent Eustace, interspersed with those from the daughters of an English family staying in Rome during the French invasion of 1849. The plot concerns the disastrous effect of a series of lost, delayed or misdirected letters on a nascent love affair. The Trevellyn family make a hasty departure from occupied Rome, and Claude, in hot pursuit, is frustrated at every turn as one after the other of Mary’s letters goes astray, as this short extract illustrates: “Gone to Como, they said; and I have posted to Como. / There was a letter left; but the cameriere had lost it. / Could it have been for me?” (IV.II. 19-20). One of the more obvious ways in which the material dimension impacted on the practice of nineteenth-century letter-writers was through their choice of stationery and writing implements. The type and quality of the postal products they used had a significant effect on the length and frequency of their correspondence and on the creation of an “epistolary self”. The huge increase in the volume of letters sent during the mid-nineteenth century had fuelled a booming trade in the manufacture of postal accessories of all kinds—from decorative writing paper and envelopes to state-of-the art pens and multi-coloured inks. Pens, paper and ink had the capacity to evoke the physical presence and distinctive characteristics of the writer. Browning, for instance, was captivated as much by the “subtle charm” of Barrett’s handwriting and stationery—“the dots and traces, the seal, the paper”—as by the content of her letters (BCLetter 2222). Writing materials strongly influenced the image of themselves that Victorian letter-writers wished to project; they were, as Nigel Hall has highlighted, an expression of the writer’s status, values and beliefs (Barton and Hall 11). Clough usually wrote on single sheets of pre-folded, octavo-sized, or smaller wove paper, whose impressed guidelines were made by the weave of wire-cloth and dandy-roll which, by the mid-nineteenth century, had superseded laid paper as the writing paper of choice (Smith 159). He also liked to try out the latest products on the market and often drew attention to their use; one letter, for example, opens with a description of the long thin sheet of writing paper as “This aboriginal fragment of paper” (unpublished portion of letter, 10 March 1854 in Mulhauser 479-80). In another, he devotes a whole paragraph to critiquing the new-style material the writing paper is made of: “This paper on which I am writing is a new phenomenon. It is made of straw; & is sold at /4d a quire. It wod be very useful I think for envelopes; for it cracks much less easily. It is rather elastic” (Mulhauser 464). He would also sometimes use the embossed letterhead of the Education Office where he worked. The relationship between a letter and its envelope was a “crucial aspect” of the epistolary process, as Milne has demonstrated (46). Representing the correspondent, the seal, especially if personalised, appeared to guarantee “the authenticity” and “intimacy” of the message (47). This is aptly illustrated in a letter from Barrett to Browning: “I really love you … & will put it into the ‘seal’ and the ‘paper’ with the ineffable other things” (BC Letter 2223). The wax seal could also be an indicator of social standing. Clough wrote most of his letters while at his office in Downing Street and sometimes sealed the envelopes with the seal of the Privy Council. The first letter he wrote from England to his friend and publisher Lowell was delayed by at least ten days because the official seal had apparently made it too heavy. Clough had then decided that “H M Coat of Arms wasn’t worth an extra shilling” and, as he told Lowell, he was unable to change envelopes at the post office, so the letter did not go—yet another example of how unforeseen material factors impacted on epistolary relationships (Mulhauser 459). In reply, Lowell joked that, in tying his subsequent letter together with red tape, “with an unconsciousness which [he was] sure was assumed,” Clough had trumped even the sealing of his letter with the “royal Coat of Arms.” And he was suitably impressed by Clough’s request to send his letters care of “Her Majesty’s Council Office, Whitehall,” declaring that he would write his initials on the corner of the envelope so that the American postmaster would know who it was that had such “august correspondents” (Mulhauser 464-65). Clough’s use of these material indicators of status—the red tape, embossed letter heading, seal etc—albeit in a rather tongue-in-cheek way—is intricately linked to the linguistic and rhetorical construction in his letters of a cultured and urbane “epistolary self,” designed to meet the expectations of his illustrious circle of Bostonian correspondents. Overt references to the type or quality of the pen used by the writer also abound in Victorian letters. That Clough was aware of the importance of quality writing implements for clarity of expression is demonstrated in a letter to a friend whom he adjures to discard “the worn stump” of his pen and to get some “decent letter-paper” and a new pen before replying to his letter (Mulhauser 36). Carlyle blamed poor-quality pens for the sorry state of his letters: “Forster you see what a pen I have: good pens, tolerable writing apparatus, have left the world!”(CLO 30:143-143); he also used the excuse of “a dirty sputtering pen” for their brevity—“I must be as brief as possible” (CLO 27:110-112). These various physical artefacts—paper, pen and ink etc—all, as James Daybell has described, had an obvious effect on handwriting (90). Samantha Matthews maintains that “a nineteenth-century writer’s autograph” was also shaped by “diverse physical, psychological and socio-cultural contexts” (15). It is certainly the case that material circumstances frequently affected Clough’s autograph; the fact that he usually wrote during breaks snatched from his official duties in the Council Office, for example, would have affected the legibility of his script, and he often apologised for the indecipherability of his handwriting. Another factor which accounts for variations in Clough’s normally intelligible handwriting is the periods of ill-health he suffered, during which it became more sprawling or shaky, or when he sustained an injury—“I have strained my wrist & can hardly write in the service of HMS & so write a little in yours”, which also delayed his response to Norton’s letter (Mulhauser 489). Lowell’s excuse for his long delay in writing to Clough—that “when one is touched in the liver … it is best to keep one’s reflections in one’s inkstand”—underlines the effect of physical circumstances on a correspondence (Mulhauser 527). Handwriting in the nineteenth century had class connotations—a careless hand, for example, was widely believed to be a signifier of “social distinction and independent wealth”, although for Tennyson a legible hand was a “marker of personal integrity” that denoted “manliness” (Matthews 20, 23). Clough’s handwriting, especially in the letters to his American friends whose social circle he was keen to remain part of, was for the most part neat and readable and would, in Tennyson’s analysis, put him in the latter category. For his friends, Clough’s handwriting had the capacity to seemingly embody his physical presence and he himself often expressed his delight at the sight of a familiar hand. In his epistolary poetry Clough draws attention to the role of handwriting in the interpretation of a letter and the potential for misunderstandings that an illegible script or poor-quality paper can cause. In The Bothie, for example, the “Tutor” comments on the difficulty in deciphering his pupil, Philip’s letter—“written in scraps with crossings and counter-crossings / Hard to connect with each other correctly” (IV.156-57). He attributes the sad state of the letter to the fact that “Paper was scarce” (IV.158). As we can see from Clough’s “American” correspondence, material factors—notably a cheaper and more efficient postal service, particularly on the transatlantic routes, and the wealth of new postal products on the market—influenced mid-nineteenth-century letter-writing in a surprising number of ways. The reduction in postal charges and faster delivery times enabled Clough and his American correspondents to write more frequently and at greater length—as we can see from their voluminous correspondence—and undoubtedly had a positive effect on their epistolary relationships. Even more importantly for posterity, it is quite likely that, had it not been for the improved mail service, which had the added effect of enabling his friends to keep up the pressure on him to provide them with copy, some of Clough’s best poetry and his translation of Plutarch’s Lives would never have been completed or published in their present form. The introduction of new postal products influenced not only their handwriting but also the way that writers such as Clough and his contemporaries represented themselves on the page. Material circumstances, however, also had some deleterious effects on a correspondence. Interruptions to the postal service, whether due to public holidays, insufficient postage or the Crimean War, threatened to jeopardise Clough’s long-distance friendships as well as the publication of his poems, and caused a great deal of frustration and even despair for Carlyle and the Brownings. Poor quality postal products and even physical health also had a detrimental effect on these writers’ handwriting. The amount of space that they devoted to discussing material concerns in their correspondence is an indication of the importance they attached to the medium of communication. This is also reflected in the prominent role given to material issues—lost and mislaid letters, methods of transport and so on—in Clough’s epistolary poetry, all of which clearly shows how the material dimension of a letter is inseparable from its communicative function. Barton, David, and Nigel Hall, Eds. Letter Writing as a Social Practice. Philadephia: John Benjamins, 2000. The Brownings’ Correspondence; An Online Edition [BC]. Wedgestone Press, 2016. Web. 10 July 2016 <www.browningscorrespondence.com>. Butler, Daniel Allen. The Age of Cunard: A Transatlantic History 1839‒2003. Annapolis, MD: Lighthouse, 2003. Carlyle, Thomas, and Jane Welsh. The Carlyle Letters Online [CLO] Ed. Brent E. Kinser. Duke UP, 2007-2016. Web. 16 August 2017 <www.carlyleletters.org>. Clough, Arthur Hugh. “Amours de Voyage.” The Poems of Arthur Hugh Clough. 2nd ed. Ed. Frederick L. Mulhauser and Jane Turner. Oxford: Clarendon Press, 1974. 94-133. Clough, Arthur Hugh. “The Bothie of Tober-Na-Vuolich”. The Poems of Arthur Hugh Clough. 2nd ed., Ed. Frederick L. Mulhauser and Jane Turner, Oxford: Clarendon Press, 1974. 44-93. Clough, Arthur Hugh. The Correspondence of Arthur Hugh Clough, 2 vols, Ed. Frederick L. Mulhauser. Oxford: Clarendon, 1957. Clough, Arthur Hugh, unpublished manuscript letters, 10 March 1854 and 19 May 1854, Houghton Library, Cambridge, Mass. Clough, Arthur Hugh. Plutarch’s Lives: the Translation called Dryden’s, 5 vols, Boston: Little, Brown; London: Sampson Low, 1859. Daybell, James. The Material Letter in Early Modern England:Manuscript Letters and the Culture and Practices of Letter-Writing 1512‒1635. Basingstoke: Macmillan, 2012. Earle, Rebecca, ed. Epistolary Selves: Letters and Letter-Writers, 1600‒1945. Farnham, Surrey and Vermont: Ashgate, 1999. Golden, Catherine. Posting It: The Victorian Revolution in Letter-Writing. Gainesville, Fl: Florida UP, 2009. Matthews, Samantha. “Tennyson and Handwriting, ‘A Clean, Fair Hand’ and the ‘damn pen”’, Tennyson Research Bulletin, 10.1 (November 2012): 15-36. Milne, Esther. Letters, Postcards, Email: Technologies of Presence. Abingdon, Oxon: Routledge, 2010. Montgomery, Malcolm Beresford. 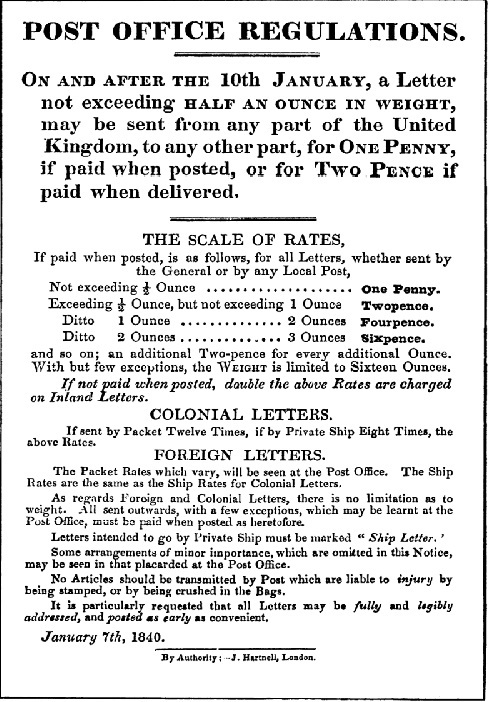 The Postage Rates of the North Atlantic Mails (1635–1950). The Author, 1991. Norton, Charles Eliot. Letters of Charles Eliot Norton. 2 vols. Ed. Sara Norton and M.A. DeWolfe Howe. London: Constable, 1913. Smith, Adele Millicent. Printing and Writing Materials: Their Evolution. The Author, 1901. “Uniform Penny Postage and the Reforms of 1839 & 1840.” The British Postal Museum. and Archive. Web. 10 July 2016 <www.postalheritage.org.uk/collections/stamps/markings/markings-reform/>. “Valentine’s Day at the Post Office” Quarterly Review, 87 (1850), 69‒115. Originally published by BRANCH Collective (June 2017) under the terms of a Creative Commons Attribution 3.0 Unported license. This entry was posted in Uncategorized and tagged 19th Century, Communication, History, Mail, Post Office. Bookmark the permalink.